Today was a day off from school for my kids. My kids were hyper from the time they got up and got worse as the day wore on. I would love to say that my nerves aren't fried this evening, but they are. I never realized when I was young just how loud and destructive two boys could be. Honestly, I never really though I would have two boys. Don't get me wrong I love my two boys, but I was totally unprepared for being the mom of only boys. In my mind I always thought I would have a boy and a girl. When my second son got old enough to move around I quickly realized being the mom of multiple boys and only boys is a feat. They are loud and very physical. Boys don't sit down and read, or daydream. They do fight, and throw rocks to see if they can break, try to kill bugs, get dirty, really, really, dirty, and generally don't sit still. It's even funner when one of your kids has ADHD and so does your husband. There are days where my house might actually resembles a madhouse. Tonight I'm just glad that tomorrow is a school day. I love my kids, but one day off was enough for my sanity. I'm also thinking that my kids will be spending a lot of time at camp this summer, as much for me as for them. The last month I have posted a couple of times about the Homemade Baking Mix that I have been using. It's really great and tonight I'm going to share a third recipe that utilizes the mix. 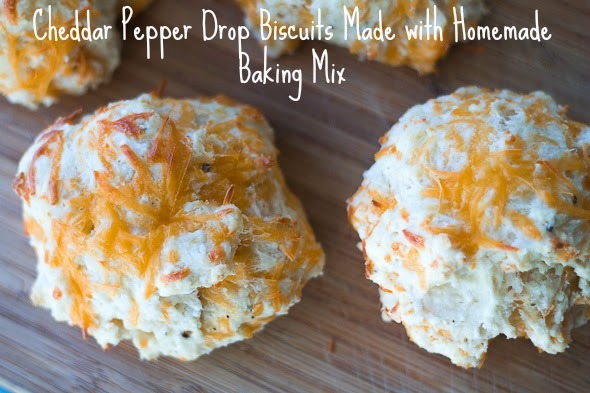 This recipe is for Cheddar Pepper Drop Biscuits and is great recipe as a side with meals. Combine baking mix, cheese, and pepper in a bowl. Add milk and cream to mixture until a wet dough forms. On a parchment lined baking sheet drop dough into 8 biscuits. 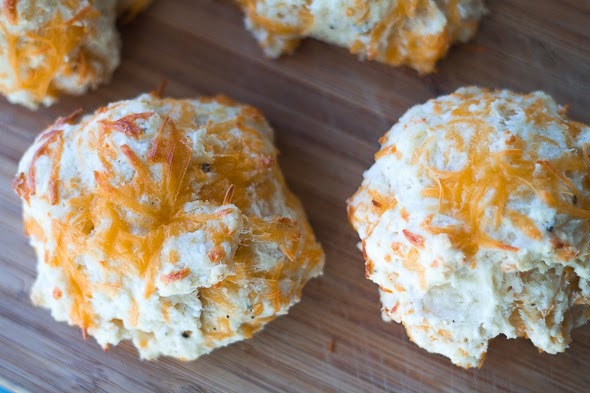 Add grated cheddar cheese to the tops of each biscuit. 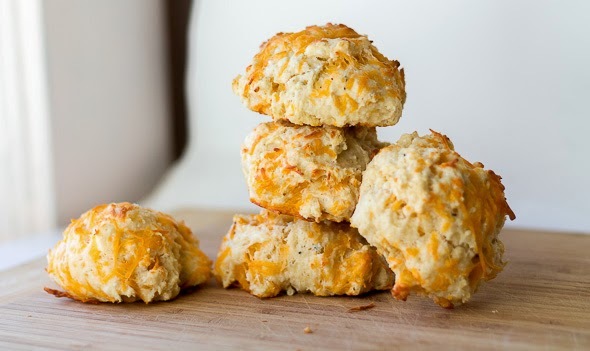 Bake biscuits in a preheated 375 degree oven for 20-25 minutes. Serve warm or reheat when ready to eat. Since everyone has slightly different measuring cups the amount of heavy cream can vary. The original recipe used 1/3 cup. I found that that wasn't nearly enough. I have made this recipe a number of times and the total amount of cream needed has ranged from 1/3 cup to over 1/2 cup. Basically add cream until the dough forms and is moist. Additionally, if you want to save on fat you can add 1/3 cup cream and then slowly add additional whole milk until the dough is the right consistency. I have used low fat cheese with this recipe and it worked fine. I accidentally bought low fat cheese and was worried that it wouldn't melt etc, but it was a fine substitute. Make sure to store your homemade baking mix in the fridge, it will go bad since it has butter in it.